Eugenics movements gained momentum throughout Eastern Europe between World Wars I and II. Maria Bucur demonstrates that the importance of the eugenics movement in Romania rests not so much in the contributions made to the study of science as in the realm of nationalist ideology and social policy making. The notion that the quality and quantity of the human species could and should be controlled manifested itself through social engineering projects ranging from reshaping gender roles and isolating ethnic undesirables to introducing broad public health measures and educational reform. Romanian eugenicists sought to control such modernization processes as urbanization and industrialization without curbing them, yet they also embraced attitudes more typically identified with anti-modernists in Romanian politics and culture. Bucur is the first historian to explore the role of eugenics as a response to the challenges of nation- and state-building in Eastern Europe. She presents a balanced assessment of the interwar eugenics movement’s success and failures and identifies connections and discontinuities between the movement and the post-war communist regime. Bucur, Maria. 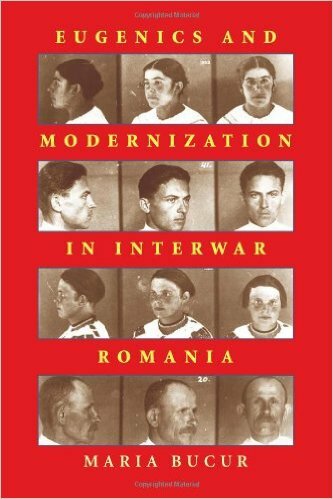 Eugenics and Modernization in Interwar Romania. Pittsburg, Pa: University of Pittsburgh Press, 2002. Print.